GFR1219, originally Named “Cathy” was caught 152 miles from original tag location. The Cobia (Rachycentron canadum) named “Cathy” (Tag ID: GFR1219) was originally tagged & released by angler John Ozer on December 16, 2015 while fishing just a few miles south/east of Key Biscayne, Florida. Mr. Ozer chartered a boat with legendary Captain Bouncer Smith and mate Abie Raymond and set out aboard the Bouncer’s Dusky 33. The crew fishes out of Miami Beach, Florida. The Cobia was measured to be 28 inches (71.12 cm) total length with an approximate weight of 6 pounds (2.72 kg). The crew used live bait and tagged and released the fish in excellent condition to allow it to grow and to possibly be recaptured one day. Incredibly on March 13, 2017, one year and three months later or 452 days to be exact, that same Cobia “Cathy” was recaptured by Captain Jimmy Jones of the boat “Little Gigger” out of Shalimar, Florida. The fish was once again caught in excellent condition and it had grown to about 37 inches (93.98 cm) in length. 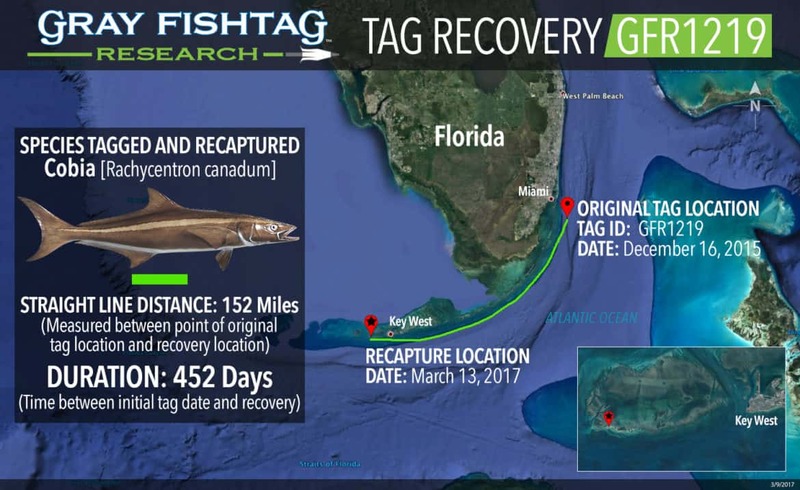 The recapture took place about 11 miles west of Key West, Florida and approximately 152 miles (248 km) away from the original tag location. We cannot draw any definitive conclusions of where the fish went during the 452 days. However, we do know that it was back in the warm coastal waters of South Florida and the Florida Keys. The Florida Keys, are known for its warm waters and rich sea life and multitude of fish species. The area is ideal for both inshore fishing and provides fast and easy access to world-class off shore fishing as well, making it an ideal fishing destination combined with a rich history of fishing. Recaptures such as this one are truly amazing and entice us to continue our quest of tagging fish and learning more about each species. Our program is constantly growing with new species being tagged in new regions every day. However, to continue to expand effectively we need your help. We like to deploy satellite tags on various species to take the guess work out of the migration patterns. This cobia was swimming healthy for nearly a year and a half and was recaptured 152 miles away, yet we do not have the exact data on where it went between the original tag location and its recapture location. One can only imagine all the conclusions and information we could produce with the data a satellite tag could have provided. We are desperately seeking funding to continue to provide data and conclusions to the general public at no cost. GFR Cool Facts: The predators of the cobia are not well documented, but the mahi-mahi (Coryphaena hippurus) is known to feed on juveniles and the shortfin mako shark (Isurus oxyrinchus) feeds on the adult. The Gray FishTag Research program has been able to shatter the expectations for fish recapture rates thanks to the hard-working professional fishermen on the water day in and day out. Tags are provided free-of-charge to the collaborating professional fishermen, and the tag data is available to the public at www.GrayFishTagResearch.org. The Bouncer’s Dusky 33 charter boat crew will receive some Gray FishTag gear for their tagging efforts. The tag recovery angler, Jimmy Jones, will receive a pair of Costa Del Mar sunglasses, a Tag & Recovery Certificate, and Gray FishTag gear for reporting the tag recovery.